Bar Harbor is a town on Mount Desert Island in Hancock County, Maine, United States. Kick off your visit on the 30th (Fri): cruise along Park Loop Road, then take a peaceful walk through Indian Point Blagden Preserve, and then head off the coast to Mount Desert Island. Here are some ideas for day two: look for all kinds of wild species at Shore Path, then don't miss a visit to Land Bridge to Bar Island, and then take in the awesome beauty at Cadillac Mountain. For traveler tips, maps, where to stay, and other tourist information, go to the Bar Harbor trip planning app . Manchester, UK to Bar Harbor is an approximately 15-hour flight. You can also do a combination of flight, bus, and shuttle. Traveling from Manchester to Bar Harbor, you'll gain 5 hours due to the time zone difference. When traveling from Manchester in August, plan for somewhat warmer days and about the same nights in Bar Harbor: temperatures range from 28°C by day to 16°C at night. Finish your sightseeing early on the 31st (Sat) so you can drive to Ogunquit. 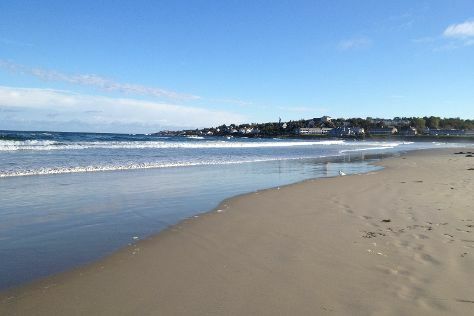 Ogunquit means "beautiful place by the sea" in the language of the Native Americans who inhabited the region long ago, and this remains an accurate description of this holiday destination today. Kick off your visit on the 1st (Sun): kick back and relax at Ogunquit Beach, then get to know the fascinating history of Marginal Way Walkway, and then explore the striking landscape at Perkins Cove. On the 2nd (Mon), you'll have a packed day of sightseeing: take in the architecture and atmosphere at St. Ann's Episcopal Church, then tour the pleasant surroundings at Parsons Beach, and then stroll through Drakes Island Beach. For ratings, other places to visit, traveler tips, and tourist information, go to the Ogunquit trip maker website . Getting from Bar Harbor to Ogunquit by car takes about 4 hours. Other options: do a combination of flight and bus; or do a combination of car, flight, and bus. Expect a daytime high around 31°C in August, and nighttime lows around 14°C. Finish your sightseeing early on the 2nd (Mon) so you can travel to Nantucket. Nantucket is an island about 30mi by ferry south from Cape Cod, in the American state of Massachusetts. Start off your visit on the 3rd (Tue): enjoy the sand and surf at Nobadeer, tour the pleasant surroundings at Madaket Beach, and then enjoy the sand and surf at Cisco Beach. On the next day, enjoy the sea views from Sankaty Head Lighthouse, then stroll through Surfside Beach, and then stroll through Jetties Beach. To see other places to visit, reviews, maps, and more tourist information, read our Nantucket trip itinerary planning site . Traveling by combination of car and ferry from Ogunquit to Nantucket takes 4 hours. Alternatively, you can do a combination of bus and flight; or do a combination of bus and ferry. Plan for a bit warmer nights when traveling from Ogunquit in September since evenings lows in Nantucket dip to 17°C. Wrap up your sightseeing on the 4th (Wed) to allow time to travel to Hilton Head. A Hilton Head vacation may be heaven for a golfer, but the area also offers all kinds of other options for sports fans. Start off your visit on the 5th (Thu): kick back and relax at Alder Lane Beach Access, get a new perspective on things with Boat Tours & Water Sports, and then trek along Hilton Head Island Bike Trails. On your second day here, race across the water with a speed boat tour, enjoy the sand and surf at Coligny Beach, then zoom along the surf with a waterskiing or jet-skiing adventure, and finally sample the fine beverages at Hilton Head Distillery. Discover how to plan a Hilton Head trip in just a few steps with Inspirock's itinerary builder. Fly from Nantucket to Hilton Head in 8.5 hours. Alternatively, you can do a combination of flight and bus; or do a combination of ferry, bus, and train. In September, Hilton Head is a bit warmer than Nantucket - with highs of 34°C and lows of 25°C. Wrap up your sightseeing on the 6th (Fri) to allow time to drive to St. Augustine. SAINT AUGUSTINE | PONTE VEDRA on Florida's Historic Coast The Nation's oldest city (est. Start off your visit on the 7th (Sat): kick back and relax at Crescent Beach Public Beach, then kick back and relax at Frank Butler County Park West, and then sample the fine beverages at St. Augustine Distillery. Get ready for a full day of sightseeing on the 8th (Sun): kick back and relax at St. Augustine Beach, explore the galleries of St. Augustine Lighthouse & Maritime Museum, Inc., and then don't miss a visit to St. George Street. For photos, where to stay, traveler tips, and tourist information, refer to the St. Augustine trip planner. Traveling by car from Hilton Head to St. Augustine takes 4 hours. Alternatively, you can do a combination of taxi and train; or take a bus. In September, plan for daily highs up to 34°C, and evening lows to 26°C. Wrap up your sightseeing on the 8th (Sun) early enough to travel to Key West. Start off your visit on the 9th (Mon): explore and take pictures at The Overseas Highway, then stop by Isle Cook Key West, then get engrossed in the history at Truman Little White House, and finally enjoy the sand and surf at Fort Zachary Taylor. Here are some ideas for day two: zoom along the surf with a waterskiing or jet-skiing adventure, then get up close to creatures of the deep with a dolphin and whale watching tour, and then sample the fine beverages at Key West First Legal Rum Distillery. To find ratings, more things to do, other places to visit, and tourist information, you can read our Key West day trip planner. 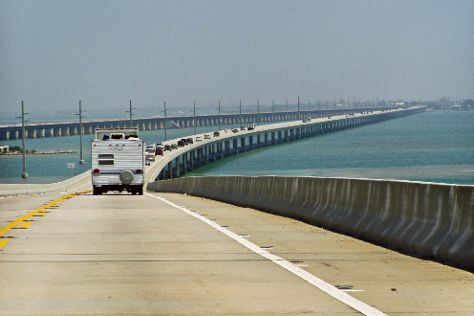 Traveling by combination of car and flight from St. Augustine to Key West takes 6 hours. Alternatively, you can do a combination of bus and flight; or drive. Plan for somewhat warmer nights when traveling from St. Augustine in September since evenings lows in Key West dip to 31°C. Wrap up your sightseeing on the 10th (Tue) early enough to take a bus to Marathon. 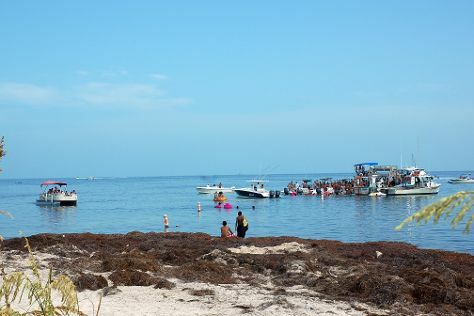 On the 11th (Wed), look for all kinds of wild species at The Turtle Hospital, kick back and relax at Sombrero Beach, and then see what you can catch with a fishing tour. For photos, more things to do, traveler tips, and other tourist information, use the Marathon online road trip planner . Traveling by bus from Key West to Marathon takes 1.5 hours. Alternatively, you can drive. In September, daytime highs in Marathon are 38°C, while nighttime lows are 30°C. Finish up your sightseeing early on the 11th (Wed) so you can travel back home.